Established in 2004, Centurion is a sophisticated business hotel at Shivajinagar and here’s why you should book a stay out here on even if you aren’t travelling for work. Unlike many business hotels, Centurion has an instant home-like feel to it. 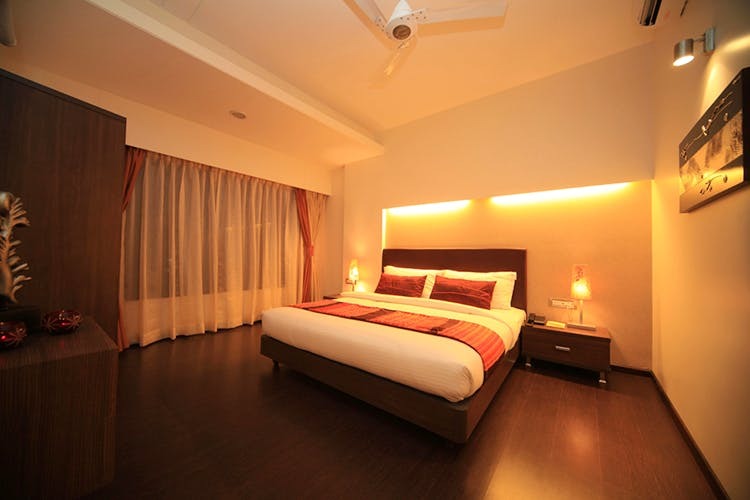 The facility boasts of 54 gorgeous rooms, bifurcated as suites, executive and comfort rooms. Every room is beautifully designed in soft hues, plush furniture and is well-appointed with all the basic necessities including WiFi, TV, toiletries and all-day-long room service. Which means if you and bae check in here, you have no need to step out and can relax and stay in all day! Apart from the experience, what makes Centurion a perfect choice for a short staycation is that it’s extremely affordable, despite all the luxurious treatment. In fact, we hear, their comfort rooms start at INR 1,950 per night while the suites cost about INR 4,000 per night. However, the pricing depends on the availability and the season. We suggest you get in touch with the hotel here for more details on the bookings. What’s more? Centurion Hotel also has an in-house restaurant, Silver Leaf that dishes out the best of European, Continental and Oriental gourmet delights. The property also has Centurion Inn on Ganeshkhind Road in Shivaji Nagar. The inn is a vegetarian boutique hotel with 27 well-appointed business-class rooms.